You will be staying in a geust house at Kafnu. Accommodation on all other days will be in tents (2-3 per tent). 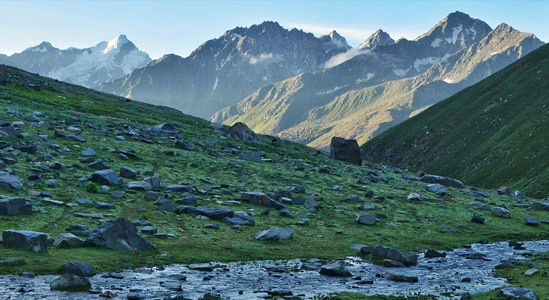 Pin-Bhabha pass is one of the most interesting when it comes to Himachal Treks. It lies at the head of a beautiful alpine valley. During this trek the landscape changes dramatically with pine and cedar forests which then is replaced by barren landscape. Being a moderate to difficult level of trek, the challenging trails and altitude is exciting for trekkers. 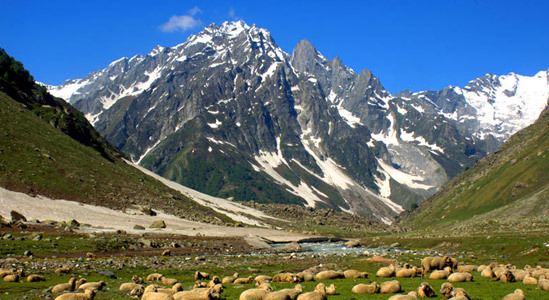 8 days of high cross over trek which gives you extraordinary mountain scenery of Spiti Valley. People know about this trek due to which Trekveda is here offering you Pin Bhaba Pass Trek. The trek starts from a quaint village called Kafnu situated at a distance of about 200 km from Shimla. Trekkers will pass a few number of river along the way which is challenging. There is a lot of excitement during this trek as you get to trek a lot of different trails. The difficulty level during this trek is from moderate to difficult due to rocky moraine paths, glacier covers and river crossing. Trekkers are required to have a good fitness level for this trek. This trek is an experience for lifetime due to high-altitude mountain pass-crossings over the Bhaba and Pin valleys at 16,105 feet. You will get a panoramic 180° view of the Bhaba and Pin valleys from the top which is spectacular. This trek is different in many ways as the forests are enchanting when we pass through Mulling. There are pine trees everywhere. You will experience dramatic change of landscape scenery which turns from lush grasslands to desolate mountain range. Meadows are well-endowed in Pin and Upper Bhaba which is like a heaven for the shepherds. At the day first you have to drive from Shimla to Kafnu (205 Km), and it will take 7 hours to reach Kafnu. First day of trek will be easy to moderate. The trek will start from Kafnu towards Mulling. This journey is beautiful but a challenge on the other hand so be prepared. Trekking for a while on the road, we then head up-valley to a bridge. After crossing the bridge we reach to left bank of the Bhaba river. Continuing the trek will lead us to dense vegetation of jungle. There are silver birch, pine and oak trees all around you. It will take around 6 hours to reach Mlling. This day includes river crossing which makes this trek more interesting. The trail starts with a gradual ascent through a rocky terrain and after walking for a while, we will arrive at a waterfall and beautiful meadow. After passing the medows, you will come across beautiful carpets of alpine flowers. Gradually after gaining height, we will reach Kara. The campsite at Kara has amazing views of a range of peaks on the border between Kinnaur and Spiti.. This trek includes steep ascent throughout the trail. This trek is short and will cover only 4.91 km but you have to be prepared for a steep ascent ahead. The trail further is of stones and humps till we reach Phutsirang. This day can be a lot tiring due to the rough trail but reaching to our destination will treat you with the perfect view of three mountain passes i.e. Nimish Khango, Tari Khango and Pin Bhaba Pass. This day leads us to the direction of Bhaba Pass. After trekking for a few meters, we will come across a melt-water stream and then climb steeper ground to reach a plateau. Then we will pass the lowest point on the surrounded ridge and climbing directly upwards. The view and sceneries from this height is amazing. After reaching Spiti region we make a direct descent into the valley below. The landscape of Spiti is a wonderful collage of grasslands and mountains. We will follow a trail that traverses north before the last descent. A little before traversing above the Pin river we will descend to Bara Bulder camp. This is a 13km trek in which we will go back to Mudh. The trail is well gradual and well paved. We will be crossing the Pin River and Mudh village, which is the last village in Spiti region. We will stay here for rest of the day so that the trekkers can explore local area and rest. Pin Bhaba Pass Trek is a moderate grade trek which can be done by the beginners as well provided they have had their physical and mental work done before at least 2 months. Despite of being a moderate trek, there are certain things that are needed to be taken under the consideration before you head to the Trek. The trek expense of Rs. 13,500 + 5% GST takes care of all expenses of the trek from Kafnu to Mudh. Backpack offloading charges - If you wish to offload your backpack, there will be an additional charge of Rs. 2100 + 5% GST. The backpack cannot weigh more than 9 kgs. Suitcases/strollers/duffel bags will not be allowed. Please note that charges will vary for last minute offloading in case you decide to offload your bag after reaching the basecamp (Rs. 2400 + 5% GST). Online offloading in advance is possible up to two days prior to the trek start date.